Love this rug! Looks like pictured. It isn't a thick rug at all and I wouldn't maybe recommend it for a baby room, but it will be perfect for the office. You wont be disappointed. Capture a high-fashion, contemporary style with the Gerry rug from Strick & Bolton. 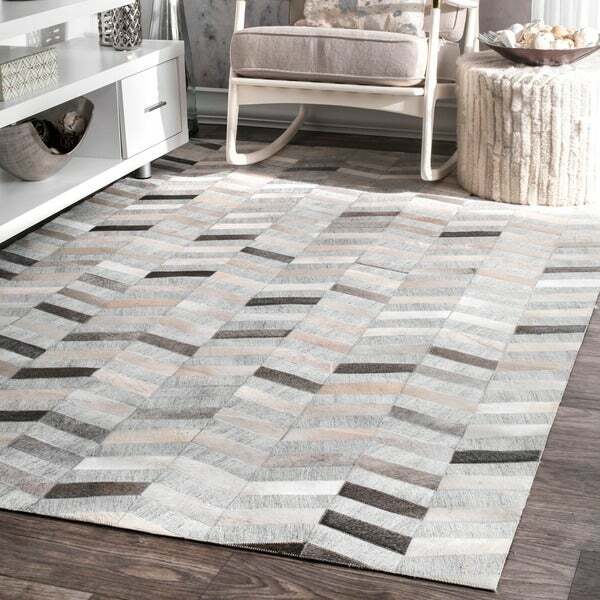 Handmade in a herringbone pattern made of viscose and cow hide, this rug has a sleek look that suits a modern style. This is a great rug, and it is at a fair price for the size and the quality and detail. Love the modern pattern and warm colors. It is on the thinner side, but that's hide for ya. A nice pad underneath made it feel great. I just love this rug! The colors are a perfect combination of neutral colors that blend very well together. It is of high quality and it has been holding up well even on a high traffic area like my mudroom. Stunning! I spent a long time looking for the perfect rug in our dining area, and I'm so glad I found this one. It is a very thin carpet, which works fine in our room. The colors very pretty and brought my whole style together. I sprayed ours with scotch guard before we used it since it was in an area we eat at everyday, and we never had any issues. I would recommend this not only on quality but the great price! I absolutely love this rug. It looks great in my apartment. I bought the 8' x 10' rug and added a rug pad. The rug itself is thin but sturdy. It definitely doesn't look cheap and with the rug pad you will have a nice cosy rug. 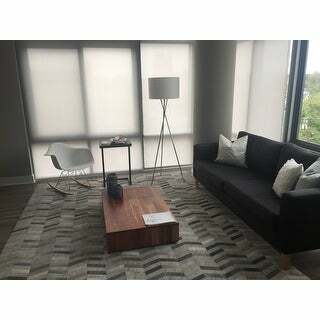 I actually tried to cancel the order of this rug before it was in transit but Overstock was unable to do that so I planned on returning it once received because I decided it would not work in my space. BUT when it arrived I decided to lay it out (after an hour of getting it out of the packaging) and the look of it is stunning and high end for sure. This is NOT a cheap looking rug, so you do get what you pay for. The issues are that it is leather so it is NOT soft as one Overstock question/answer stated, not soft at all actually. It is also very thin as other reviews stated and is not a good rug for a high traffic area. But if you need a carpet for light foot traffic and high end aesthetics, then this is for you!!! It truly is stunning and the look of the patchwork and silvery gray background is awesome! Needless to say, I am keeping it! This rug is amazing. I bought it for our office and it's a perfect fit. Looks great against our dark wood floors. Love the texture of the rug. I would say though we did not have as much dark grey chevrons as is noted in the picture but it still looks amazing. Also it is not a thick rug if that is what you are looking for but for the office purposes it works well with needing to rolling a chair over. It's very thin which I was expecting but be sure to get a thick pad. ALso, has an intense chemical small. If I was more patient I would have kept it in the porch for a couple of days to let it air out. However I'm very happy with the purchase. This rug is stylish and looks considerably more expensive than it is, I just got it, but the quality seems very good. When I first rolled it out, the edges curled, but it quickly went flat, it has a pad on the back, so I did not need to use an additional rug pad and it doesn't move around on my hardwood floor. My designer friend loves it and all my friends compliment it's high style look and luxurious feel. Love the colors and unique design. Seems well made although it's not in a high traffic room. Good area carpet for the price. 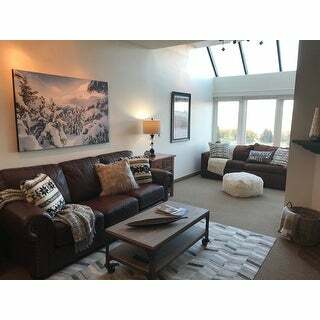 Updated a condo for sale, ordered for a client and they absolutely LOVE it! It pulled the whole room together. I know I'll be ordering more of these. Thank you! This one is a real conversation starter. Just wish there was a bigger version. We always get compliments on this rug. Our friend bought something similar from Italy for like $3k and we set out looking for a cheaper alternative and this works perfectly. Looks much more expensive than it was. A great piece for under the table. Cleans easily too. It is a lovely rug and I'm very happy with the quality and the look of it. Every one who sees it raves about the quality and the look and I'm very pleased with overstocks efficiency and customer care policy. Very pretty, but not holding up. The fabric patches get caught in the vacuum and pull loose, and some of the fur has rubbed off of the leather in the area right in front of the couch. I keep mending the fabric, but we will need to replace it eventually. Only 2.5 years old. This is a beautiful rug but if it is in a high traffic area, i recommend upgrading to the full hide version. This one started fraying on the threaded sections after a about a year, so i bought the full hide version and it is wearing much better 2 years later. Was a bit skeptical but love the rug. It is quite thin but looks really pretty. Recommend adding a rug pad to give it some dimension. Goes with everything! This rug is beautiful. Compared to similar rugs, it is a great price and the quality is really lovely. I had a hard time getting it to lay flat on the corner at first but I just kept some heavy books on top of it for a few weeks and it eventually flattened out. Absolutely love this area rug. It adds sooooo much to my room and is great quality. "What is the size of the carpet?" You can choose the size under the options tab. "do you have a date when this rug will be on stock?" "What is covered in protection plan and how would this hold up under a dining room table? How do you deal with spills? " The plan will cover: Food or beverage stain, Human or pet bodily fluid stain, Border tear from a specific incident, up to 6 inches in length. Since the rug is made out of leather and Viscose, it should hold up well under a dining room table. In case of spills, spot treats using a damp cloth with a mild detergent, wiping the hide in the direction of the hairs. We recommend using professional cleaning. "How do you clean this?" We recommend spot cleaning with a damp rag for spots and stains, but professional cleaning is best for long term cleaning and any tougher stains and messes. "could you please tell me the size of each arrow for a 9 by 12 rug. Thanks"
"Does the leather part have fur or is it just leather?" "Love the look of this. But it's for our basement so ideally want something cozy.... How does it feel on your feet?" Stellan Handmade Geometric Gray/ Beige Area Rug (8' X 10') - 7'10"x9'10"